PREACHER SPECIAL: CASSIDY BLOOD & WHISKEY pg 18. 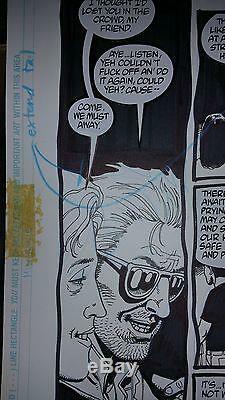 This is the original art for pg 18 of Cassidy Blood & Whiskey, one of the Preacher specials. The art is in great shape with a little bit of corner wear. There are three pieces of tape which you can see in the pictures. All the word balloons are still pasted into place. It measures roughly 11 x 17. Cassidy is in all 5 of the 5 panels on the page and you get a Batman reference to boot. If you have any questions please ask. Thank you and good luck. I never use stock photos. Be sure to check my other auctions for Comics, Toys and Books. 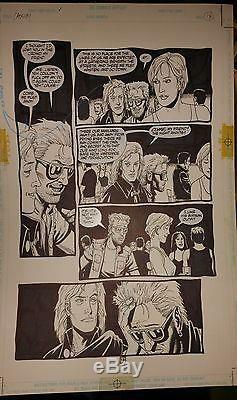 The item "Preacher Special Cassidy Blood & Whiskey pg 18 Original Art by Steve Dillon" is in sale since Saturday, July 30, 2016. This item is in the category "Collectibles\Comics\Original Comic Art\Interior Pages". The seller is "greggmcg" and is located in Lutz, Florida. This item can be shipped to United States.